I honestly think that this post will be the post to end all other posts. 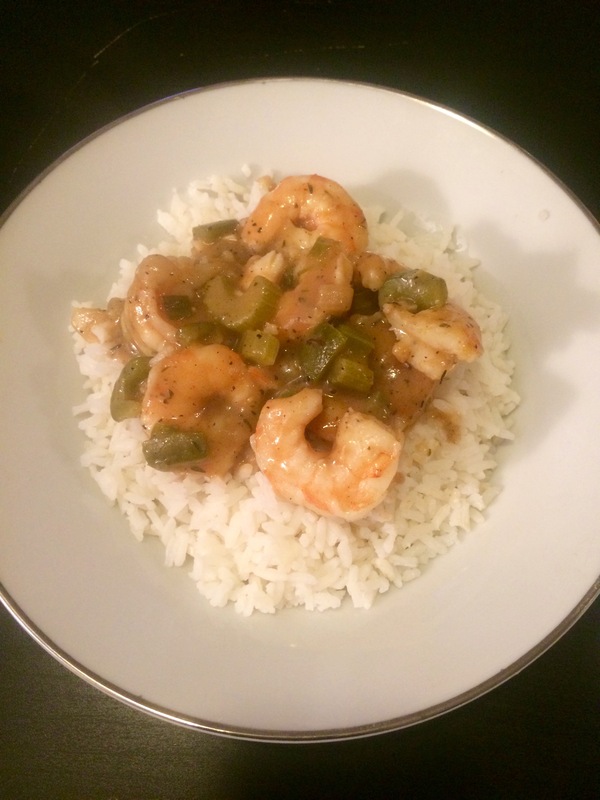 I am about to introduce my Shrimp Étouffée recipe out into the world! I’ve been holding off posting this, because I have bitter-sweet feelings about making this recipe public, but in the end I decided it would be immoral to keep hidden. But let it be known that this recipe is a Crushin’ It Original. My grandfather was an extraordinary cook, and he actually taught cooking classes in the DC area and had a devout following. The reason that my grandfather’s followers were so committed was because of his teaching style; he went into long-winded explanations about where the food came from and why and gave a history/geography lesson with each dish. I never attended one of his classes, but his knowledge and vast recipe collection was passed down to me through my dad. And this recipe is one of his best for sure. The flavors and heat of this dish are incredible, and let me say, HOT. HOT HOT HOT. The original recipe calls for double the cayenne pepper that I put in. The first time I made the dish my mouth was on FIRE, and not just that, I was sweating profusely and my stomach lining itself seemed to burn. Needless to say I cut the cayenne pepper in half after that, and in my opinion it’s perfect. It still is freaking hot! I’m not like cajun or anything but I DO love spicy food, but seriously who the hell could tolerate that original amount of cayenne?? I dare you to try it with two teaspoons instead of one. I dare you. Anyways, my boyfriend loves this dish. I think it’s his favorite out of everything I’ve ever made. I actually think it’s my own favorite too. And it’s not even that hard to make, it just takes a little bit of time to make the shrimp stock and the roux. But this meal is perfect for date night with bae; he’ll be impressed, I swear. Unless of course your bae doesn’t like spicy food… but then I guess you really shouldn’t be dating him in the first place so it’s fine. Oh also if your boyfriend has IBS you also probably should NOT feed this to him. Also, this dish is pretty legit. It is actually better and more flavorful than any étouffée I had while we were in New Orleans in February (yes, I went to Mardi Gras). So we get down there and tried many different étouffées but we both agreed that mine takes the cake. Of course, our judgment was probably slightly impaired… only slightly…. 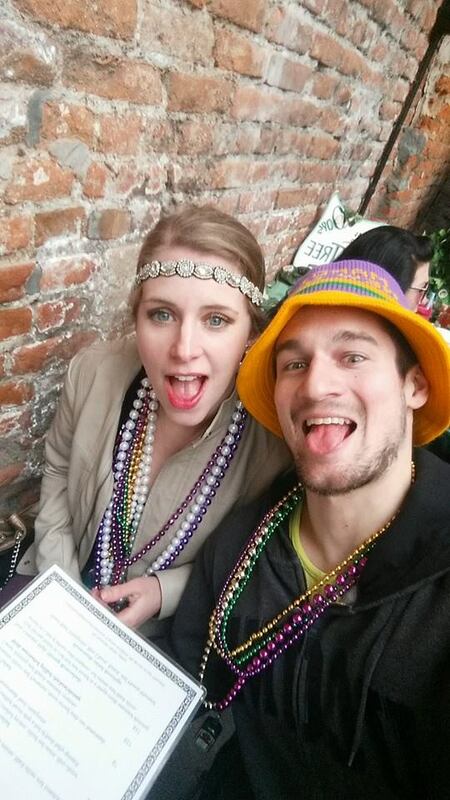 This is a picture to show that we totally acclimated to the cajun culture by eating at Patty O’Brien’s on Bourbon Street. So obviouslyyyyyy that picture means that I know cajun food. Lol jk. But still believe me when I say that this dish is on point. Make a shrimp stock. To do this, peel the shells and tails off the shrimp and set aside. Keep peeled shrimp in the refrigerator until later. Bring 5 cups of water to a boil in a sauce pan and add the shrimp shells. Boil uncovered for about 15 minutes until the liquid has reduced from 5 cups to about 4 cups (you will probably have to estimate). Strain the liquid and save the shrimp stock for later, and discard the shells. The stock should be slightly pink. Next, make the roux. To do this, heat a stick of butter in a large pan and when melted, incorporate 8 tablespoons of flour into the mixture. Stir constantly because this mixture will burn easily! Stir for about 20 minutes until mixture has thickened and is medium brown in color and has a peanut-buttery consistency. Add the onion, celery, scallions, pepper, and garlic. Stir this mixture in with the roux until vegetable are softened and sweating, about 15 minutes. Careful, or this will burn as well. Stir frequently. Add the shrimp stock, spices, lemon juice, and Worcestershire. Let simmer for about 20 minutes, stirring occasionally. During this time, make about 4 or 5 cups of rice. About 5 minutes before serving, add the shrimp. Cook until shrimp are pink and opaque throughout, about 4 minutes. Do not overcook! This means don’t cook the shrimp after they turn all the way pink, or they will get tough. Serve on a bed of white rice and with a side of steamed vegetables or salad. 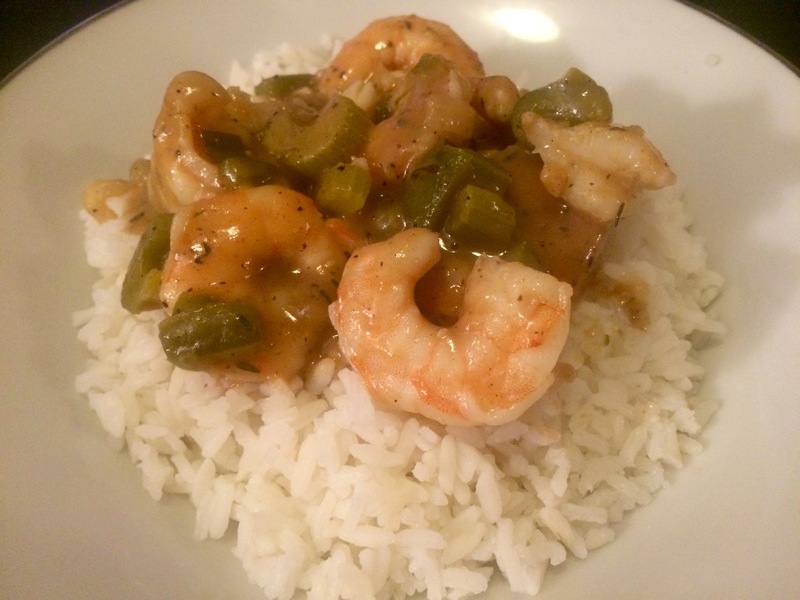 A simple butter or lemon sauce would be best with vegetables because the étouffée will overpower any sauce. For alcohol, try a toasted lager 🙂 You’ll need a refreshing cold beer to take the spice away. I wouldn’t recommend wine or liquor.